Guess which breed I am? Hint—the color is the giveaway. While the West Highland white terrier is a specific breed that happens to be white, the wheaten Scottish terrier is a color variant of a specific breed. White, black and wheaten Scotties are different only in coat shade. The wheaten terrier is a separate breed. The Westie, as his friends call him, matures between 10 and 11 inches tall at the shoulder. Westies weigh between 15 and 21 pounds. The Scottie, as he's commonly known, is ideally 10 inches high at the shoulder. He should weigh between 18 and 22 pounds, according to the American Kennel Club. In both breeds, males are larger than females. The Westie's signature white hair consists of a double coat, with the outer coat consisting of 2-inch-long hair. This outer coat is straight and hard. Some Westies may actually have a coat with a wheaten appearance, but they are not permitted in the show ring. The wheaten Scottie is so named because its coat is the golden color of wheat. Scotties have what the AKC describes as a "broken coat," with the outer coat hard and wiry and the undercoat dense and soft. To keep your Scottie's coat in shape, comb it several times a week and take her to the groomer regularly for clipping. The Westie's coat care needs are similar, but keeping her white requires frequent bathing. The spunky little Westie is devoted to her family and friendly to strangers. While the Scottie is just as devoted to her people, she takes time to get friendly with outsiders. Since both dogs were bred to hunt vermin, be careful if you have smaller pets in your household. As with all terriers, digging and barking are favorite activities. Of the two, the Scottie is more adventurous, always on the alert for fun and excitement. Both terrier breeds need a fair amount of exercise, with the Scottie probably needing more than the Westie. Either dog adapts well to city, suburban or country living. Take your dogs out for walks daily, or let them run in the backyard. Don't let either breed roam if you live in the sticks—those terrier noses can lead them far afield. All purebred dogs are prone to certain genetic issues. 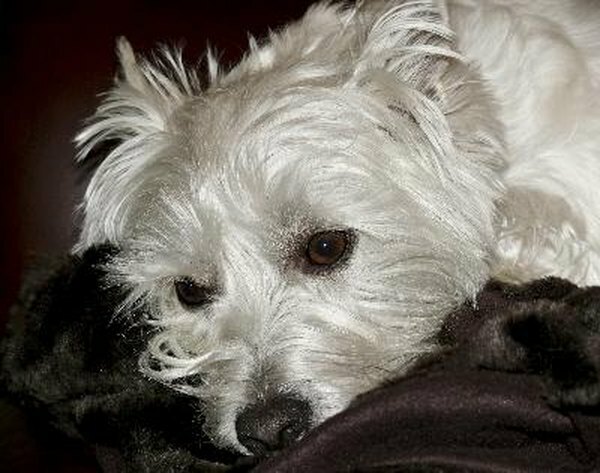 For the Westie, one of the most common is atopic dermatitis, skin allergies that cause hair loss and constant scratching. Like many small dogs, Westies may suffer from slipped kneecaps, formally known as luxating patellas. Scotties may develop Scottie cramp, a disorder peculiar to the breed that affects their ability to walk. It ranges from mild to serious. This shouldn't be confused with epileptic seizures, which also affect the Scottie.